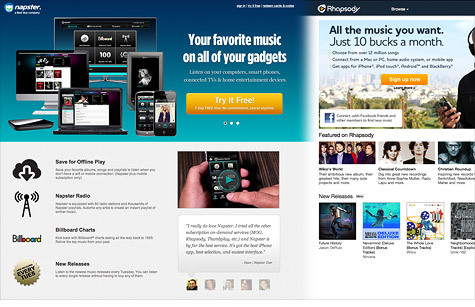 Rhapsody will purchase Napster, previously owned by Best Buy, for an undisclosed sum. NEW YORK (CNNMoney) -- Streaming music service Rhapsody will buy Napster subscribers and other assets in a bid to boost its user base. Rhapsody, the largest on-demand music service in the U.S., bought the Napster assets from Best Buy. As part of the deal, Best Buy (BBY, Fortune 500) -- which acquired Napster in 2008 for $121 million -- will receive a minority stake in Rhapsody. Financial terms of the deal were not disclosed. It should be finalized around November 30. Rhapsody president Jon Irwin said Napster's subscribers and IP portfolio will help Rhapsody acquire new members directly and land distribution deals. "This is a 'go big or go home' business, so our focus is on sustainably growing the company," Irwin said in a prepared statement. For $10 a month, Rhapsody users can download as many songs as they like and listen to them on multiple devices. The catalog currently includes 13 million songs, and the service passed 800,000 subscribers in July. But Rhapsody is being outshined by Spotify, a European-based rival with a similar business model that recently launched in the U.S. to tons of buzz. And Facebook launched its own music service, which partners with several streaming companies. Napster has struggled to redefine itself as an online music store, after its tumultuous life as a peer-to-peer file-sharing program that led to hundreds of lawsuits against users who downloaded songs illegally. Meanwhile, more tech giants are jumping into the streaming music space. In March, Amazon (AMZN, Fortune 500) announced its Cloud Drive service, which lets customers store music and other digital files on the company's servers and access them on personal devices. Apple (AAPL, Fortune 500) announced its competing iCloud service in June, which integrates with iTunes. So when a user buys a song on iTunes on one device, it will automatically push to all other devices that run iTunes for free.